then paste, edit and position on a 24 Bit, 24 million color JPEG image. 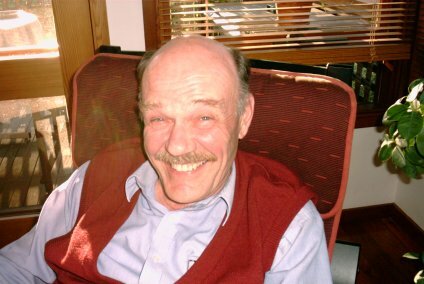 Over the summer I received an e-mail from a PSP friend 'down under' asking for my help. at a standstill. I tried the 'Arithmetic' and could get them together in black and white but that's it. Can you help me?" the head of man in the 24 bit JPEG image. Click on the Crown image title bar to select it. Pick the magic wand tool from the Tool Palette. 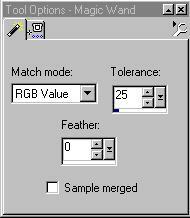 On the Tool Options Palette, set the following: Match Mode to RGB value, Tolerance to about 25. Click in the white background outside the crown. Go to the word Selections on the Menu Bar and pick Invert from the flyout box. The crown is selected indicated by the marching ants marquee around it. One more step... go to Selections again on the Menu Bar and pick Modify and Contract from the flyout boxes. On the Contract Selection dialog box, set number of pixels to 1. Press OK.
Click on the title bar on the Man's image to make it the Active image. Go to Edit again on the Menu Bar and choose Paste, Paste as a new layer from the flyout boxes. The crown comes in on the center of the image. Open the layer palette in PSP if it's not already visible and notice Layer 1 above the background layer. That's the crown! All alone on its own layer and ready to edit. Part 2: Position the crown on the head and erase parts to make it fit. Pick the Mover Tool on the Tool Palette. Click and drag the crown into about the right location on the head. We will tweak its location later. 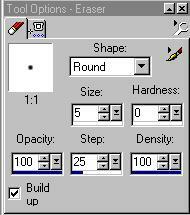 Pick the Eraser Tool on the Tool Palette. Check the Build up box. I used the zoom tool to move in closer so I could see what I was doing. Old age is tough! 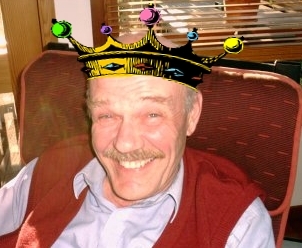 I used the zoom tool to move in close to the crown so I could see what I was doing. 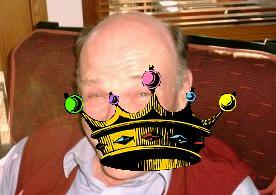 Using the Eraser Tool, erase the bottom part of the crown that should be on the back of the head. Your image should look like mine on the left. Better but not great! The crown doesn't quite fit. On the Tool Palette, pick the Deformation tool. Third tool from the top. On the screen, notice the bounding box around the crown with nodes on the corners and sides and middle. Click and drag the side nodes as well as the top and bottom ones to stretch the crown wider and a bit shorter. Clicking and dragging center node moves the whole crown around. Moving the node on the end of the stick in the middle rotates the crown. Give it a go and position and size the crown the way you want it. When you have it done, click the Apply button on the Tool Options palette or just pick another tool. My finished image looks like the one of the left. When you are finished, do a SAVE AS from the File Menu Bar saving in the PSP format. This preserves the crown layer, in case you want to reedit later. go to File > Export, Pick JPEG Optimizer and follow the instructions. That's it for today. Have Fun!